Boyd Corporation, a global leader in thermal management and environmental sealing solutions, announced the expansion of its global presence in South Asia. 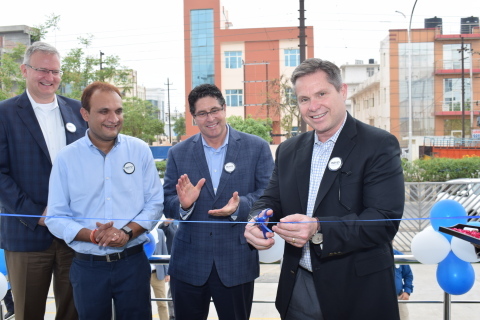 The company's latest precision converting facility, located in Noida, India, brings engineering and high-speed precision converting capabilities to sustain customers' continued growth and evolving search for new regional operational centers of excellence. The Northern India facility expands the converting footprint of Boyd Corporation a name that carries nearly a century of commitment to technological evolution and responsiveness to customer needs. The state-of-the-art Noida facility is ISO 9001 and 14001 certified featuring high-speed multi-station rotary and flat-bed converting technologies for mass production of highly complex converted components with industry-leading tolerance control and quick-turn prototyping to support accelerated new product development and design cycles with short lead times. The facility also features a Class 100K clean room and quality lab for measuring and testing equipment, sensitive material handling, and manufacturing of products with stringent cleanliness requirements. "We strongly consider our customers' regional requirements in strategic planning processes and are committed to investing in global footprint development. Responsiveness and adaptability in an everchanging global market differentiates Boyd as a strategic supply partner to many leading OEMs. The Noida converting facility will immediately support mobile electronics, e-mobility and telecommunication markets all which depend on effective sealing, protection and thermal management solutions to enhance product performance and long-term reliability for the end consumer," said Boyd CEO Mitch Aiello. "This new site sets Boyd apart as one of the only high-speed precision converting facilities in all of India. We are excited to bring new manufacturing technologies to this region and continually evolve Boyd's global presence in proactive support of our customers." Headquartered in Pleasanton, CA, Boyd operates in three continents with twenty-seven manufacturing and design centers. Existing manufacturing and design locations in Bangalore and Gujarat, India, both a part of Aavid, Thermal Division of Boyd Corporation, combined with the new Noida location positions Boyd well to support the surging growth of India's GDP with well-rounded regional manufacturing technology representative of Boyd's total portfolio of solutions. "This new site deepens Boyd's existing presence in India and enhances our ability to support customers from any global region with scalable mass production models and broadened access to Boyd's engineering, prototyping and innovative manufacturing technologies," Aiello said. Boyd's diverse and complex solutions drive value to global customers by optimizing product performance and efficiency, preventing unintended device failure, minimizing wear and tear, and extending product lifecycles with a design velocity that accelerates development time-to-market available on three continents.